Hello everyone and yes it’s been a long time since I posted but we lost a girl at work, but the atmosphere has been much better even if the work load has increase 3 fold. 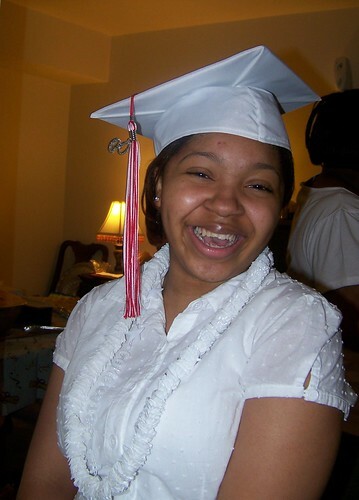 So my youngest girl Camille graduated from high school, I’m so proud!!!!! This is a very good moment as she’s been ill for the past few months and I thought it may be MONO but her test show an autoimmune disease that requires further testing to diagnose so that testing starts next Thursday keep your prayers going that it’s not Lupus as it’s high on the list due to her symptoms. 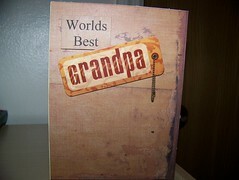 I really love card making and feel that it’s helping figure out what type of scrapper I want to really be. I hope to include some pages soon as I have some ideas brewing in my head. Well I have homework that really needs to be completed and a pizza that’s in my near future so until next time keep creating. Was outside just a minute ago taking the last meat from the grill and thought when will I have something substantial to show for all this yarn that I have. Then it hit me like a ton of bricks. 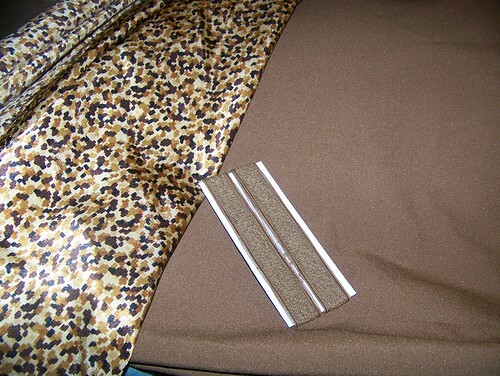 It’s been a while since I was truly able to sit down at the sewing machine and make anything. 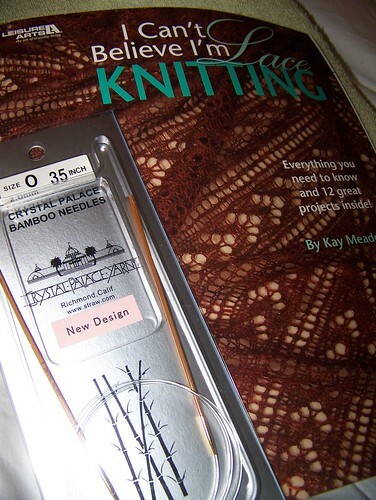 I have several new knitting patterns that I mentioned in my last post but haven’t had the time to start on any of them. 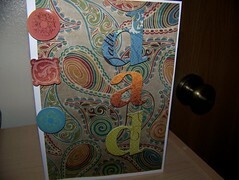 Got a new digital scrapbooking program that it took me a week-n-half to upload. Have 3 SWAP’s I’m in on RAverly and no real time to get anything done. Yes, life as it usually does has gotten in the way and I hate that because crafting is my outlet, the catalyst to relaxation. So I’ve been on edge for weeks without any real time to craft. You can normally find my efforts laying beside me the next morning with only a stitch or two completed. Work is stressful, my youngest is graduating from high school but has been ill for the past month and we still don’t know what’s going on with her yet. My boyfriend was just diagnosed with prostate cancer. To top it all off, I’m back in school and looking to start nursing school in the fall. Crocheted baby caps for a charity KnitsforNeeds. So although I’ve managed to crochet 3 caps I feel as though my creative mojo is being stifled and I want it back. Here’s the skinny on what’s been going on in my life over the past few weeks. 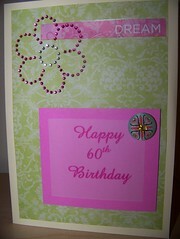 First, I discovered and have become consumed with Scrapbooking and cardmaking. 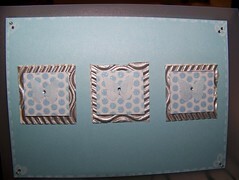 So I got a Cricut Expression….Love It and a lot of scrapping materials. Secondly, I’ve been sick with gastroenteritis and I do have to say, this thing has knocked me for a loop. Who knew working in a Pediatricians office would end up making me so sick. What I didn’t realize when all this hit me, was I thought it had passed me over. But around 8pm on Saturday night the flood gates opened and it brought me to my knees. On Sunday morning I knew if I didn’t call the Dr. my girls would have to call the ambulance to come and get me. We made it to the ER and they took me right back and hooked me up to an IV and started introducing meds. I’ve had two major illnesses since I started there back in August. I’m hoping this is it. I don’t think I could go through this again. Thirdly, there’s been the socks I’m making for my Sock It to Me 3 SWAP partner and due to the late hours and illness they haven’t made much progress. I did however make it to the heels on both today finally. I also found another pattern that I think I can complete by April 5th hopefully. Here’s a little pic to show the progress. 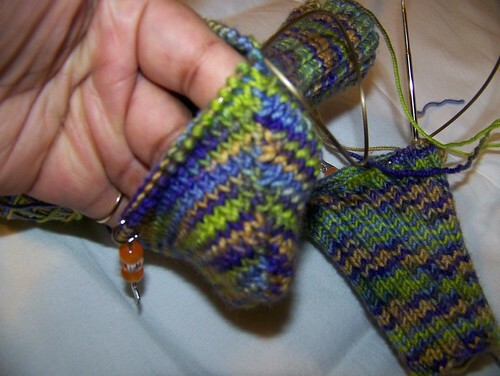 I love this short-row heel the best so far in my quest to make the perfect heels. Still waiting to hear from my Podcast Review Interviewer. Stay tuned. This will be a picture laden post as there is so much I have to share with all of you. 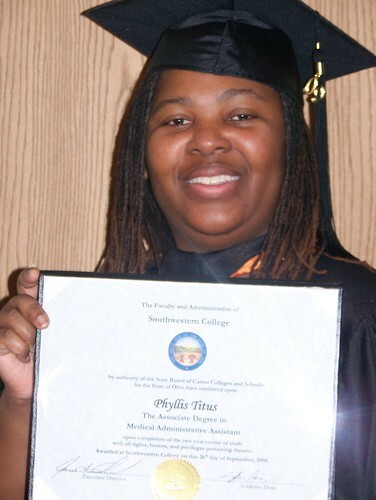 First on Jan. 16th I recieved my AAS degree and it was big accomplishment for me. There will also be WIP Wednesday pics and discussions of future project plans. 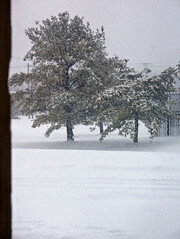 But first, I would like to share with you the wonderful weather I witness when I looked out my patio window this morning. This started late Monday night with snow then yesterday there was more snow by the evening commute there was sleet and freezing rain and now more snow on top of all of that. 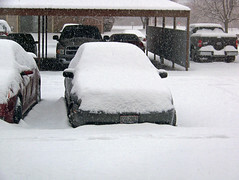 Hurray for me the Dr. couldn’t get out her driveway so we get a day off. Doesn’t my car look sad? 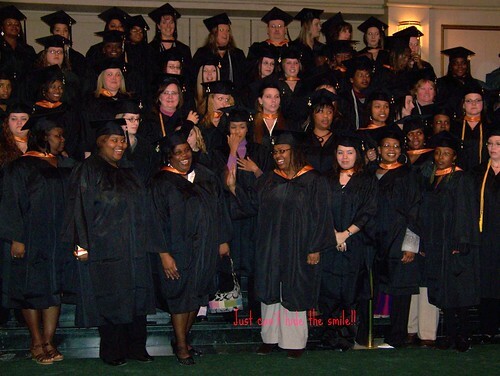 Now on to my graduation and yes, I’m so very proud of my journey. The only thing I really missed was my parents not being with me as they went to Missouri to help my brother and his family with their transition into their new jobs. So here’s some photos. Here’s the whole class and me smiling away as a classmate makes jokes. I just wrote out a ribbed pattern and she came back and asked questions and completed this. She knows the concept of knitting but this is her first completed and wearable project. I was very proud. Aren’t my babies cute? Now onto my WIP pics and future project plans. I discovered cowls on Ravelry about a month ago and really like to concept and versitility they offer. So I made the Birthday Cowl in Malabrigo. I loved it so much that I began knitting up this one also in Malabrigo in Stone Chat purchased from Eat.Sleep.Knit ran by Raveler Knittermonkey otherwise known as Erin the Great!!!! I will be adding more of these throughout the year for gift giving. 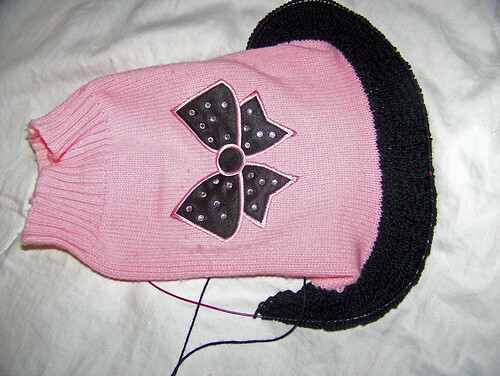 I also was asked to add a trim to a RTW doggie sweater to make it longer for the dog and here’s a pic of that. I will knit for another quarter inch and bind off. Being the fearless knitter that I am I thought I could take the ribbed edging off the bottom of this sweater and it turned out pretty good for the first time I’ve ever done this. I have gained enough confidence with this project to actually want to attempt steeking in the future. Update on lace knitting, I had spoke about my desire to try lace knitting this year and found a book on Amazon to get me started. 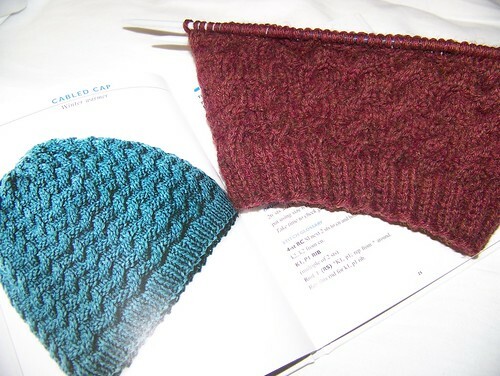 I have been reviewing this book for several weeks trying to narrow down my first project and my interest is leaning towards the Quick Scarf to get my feet wet. Well I don’t want to spend all day creating this post I want to take advantage of listening to my podcast and getting some knitting done so I’ll be back for FOF in just a few days. Before I forget, my plan is to do the Podcast review once a month as I would like to have the time to listen to at least 6 episodes from each featured podcast and if I can there will be feedback from the Show host themselves. That’s big dreaming but we’ll see what happens. The photos that you see are real. Ladies and Gentlemen picture a wonderful Christmas morning. The phone’s ringing with Merry Christmas cheer and peace and goodwill is all around. Then without warning I go to share well wishes from a text message sent by a family friend with my 2 DD’s and what my foot steps in soaking wet carpet. Immediately I’m panicking and looking in the furnace room to see what’s the problem and to my dismay a busted water pipe that has been spraying water in the walls for I don’t know how many days. 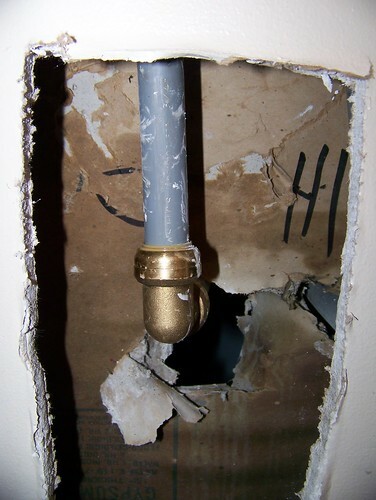 This pic is the pipe and the hole that had to be cut in the wall to fix the leak. 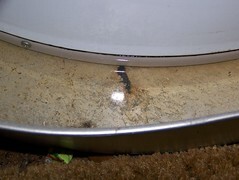 This pic shows the water that had accumulated in the well of the water heater and I was thinking OMG not a busted water heater again. 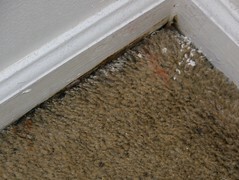 The bottom pic is the closet area in my DD’s room that is just eaten up with mildew. So that tells me there was a slow leak for some time. Just stopping by to share a little bit of creativity with you. I realized that it’s been 3wks. since my last post and although I’ve been gone I have been knitting and planning some sewing projects. 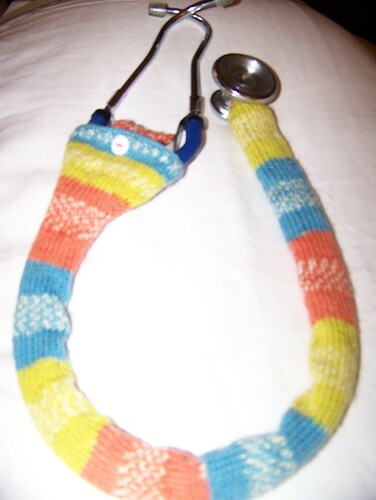 I started and finished a Stethoscope cozy only to discover it was too short and the wrong color for my SWAP partner. So, I made another one. 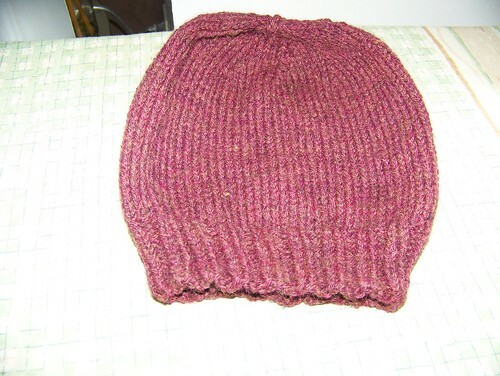 I really like this project as it is a very quick knit and a very good way to use up the self-striping sock yarn that had just been sitting in the basket longing to be made into something. Here’s the completed cozy. I’ve also started on a Cabled Cap from Tanis Gray in Vogue’s On The Go! Cables Mittens, Hats & Scarves. I love this pattern as I was one to always think cabels were just to complicated until I found Fall Cable KAL back in ’06 and made my Karoake scarf. 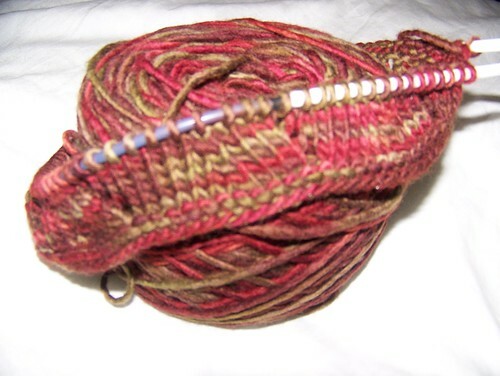 I’m using Lion Brand’s Wool-Ease in Chestnut. I don’t like that the cable definition is not as detailed as I would like but I will make this again a few times in a merino yarn. Here’s my progress so far……..tell me what you think. Erin from Eat.Sleep.Knit had a Black Friday Sale and it was absolute madness. The demand to shop her site made the server crash talk about anticipation. I finally managed to get on and complete my shopping after about 6 hours of refreshing the site. I do have to say that it was really worth it. There was the option to save up to 100% off your order YES, I did say 100% off. I did get 15% off my order and if you spend over $75 USD you get FREE shipping. I also made it to the 5M mark in the Yarnathon. It’s a competition to make the run in yarn from 1M to 26.2M along the way you win prizes and exclusive discounts. If you haven’t joined you should and did I fail to mention her shop carries Malabrigo, Lorna’s Lace and many other lovely yarns. Well this is all for now as I do want to spend the rest of my evening knitting and dreaming of creating more lovely knits. I’m even thinking of trying lace. Ok, just like cables Lace sends a bit of a tremor down my spine but I’ve always been a daredevil on my road to being creative so I just have to find the right beginning pattern. So if you know of one that jump started your love of lace please drop a comment. Stay tuned for my Creative Year In Review. 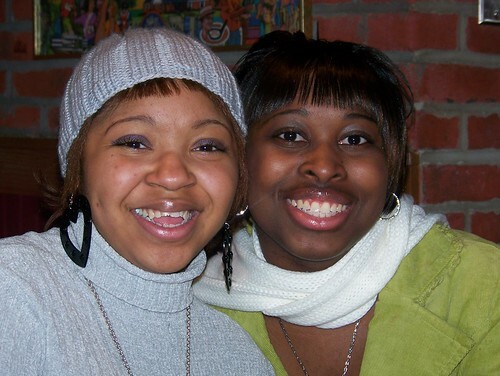 I will share a review of my crafts, lessons learned, and my creative prospects for 2009. It’s been several weeks since my last post and I wanted to do a follow-up post because this has a part 2 that deserves to be told. After I did the last post I was at my extern site and the office manager called and told me she knew of an opening; would I like to interview for the position. Of course, I said yes. This happened on a Monday, I interviewed with 2 of the Drs. and that office manager and was asked to come and shadow at their office on Thursday and by Friday was offered the position and by Monday was told they wanted me to complete my externship at their office, and could I start the next day. So for the past few weeks I’ve been at a Pediatric Practice with three wonderful lady doctors. I was so blessed to placed in a Health network with very good perks. I still will not be done with my last class until September 26th but God showed up and showed out in placing me in the right place at the right time. I have been so fortunate in my journey to this point in my life and for the past few days have seen the residue of fears fall at my feet. In saying that I do know that the advisary is on the prowl but I have no fear as I am living the 23 Psalms. THANK YOU Lord for all you’ve done for me and my house. I would like to move on to some knitting. I was able to do a bit of knitting while becoming adjusted to my new schedule. 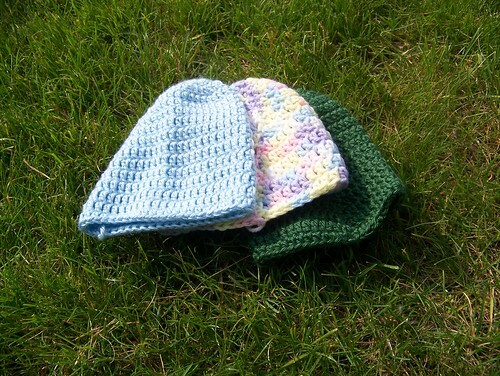 There has been some hats completed and washcloths completed all to benefit Knitters for Obama. It’s a charity that donates much needed items to homeless shelters throughout the US that focus on displaced veterans. 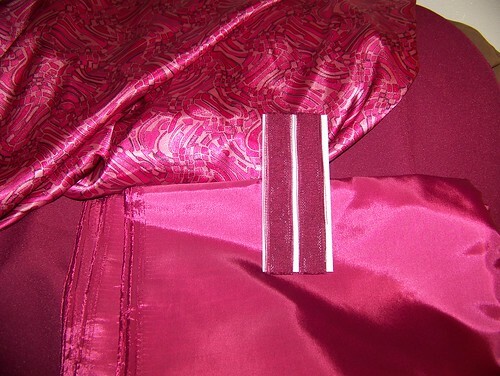 I will share photos in my next post and I will also share my ideas for some new sewing projects. It’s been a long time since I’ve said anything here on my blog. First school, extern ship, a job interview, Ravelympics, planning and life have all been in the forefront of my not getting to sit down and blog. First, I want to take some time to share something personal with you. I’ve been in school for the past two years and although I had some finances put away I haven’t really worked for more than 6 months during this time. Why am I telling you this? Well, God has been the ultimate supplier of everything I needed wanted and desired during this time and I just wanted to share that with you. It comes a time in our life when we have to lean and depend on our faith. I have spent the past two years doing just that and now as I look back and see all that He has done for me I want to shout from the roof top that all it takes is a little faith, keeping your focus, letting God direct your path and believe me when I say the favor of God will open many doors. My walk isn’t done but I walk in His footsteps and it makes each step more prosperous, more peaceful, more joyful and very blessed. Now onto my projects I had signed up for the Ravelympics on Ravelry but because I’ve been so busy I didn’t get back on in time to link to my projects and teams so I’m not officially being counted but since my projects are for charity I’m still making them. 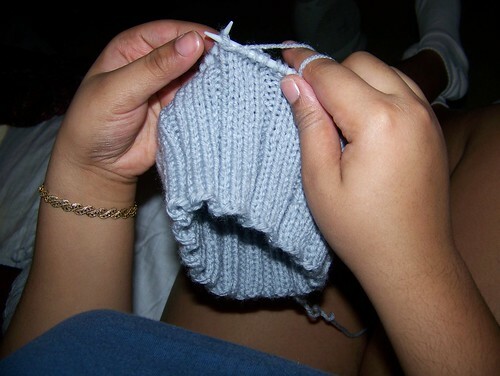 I signed up with Team Obama knitting and crocheting for Homeless Veterans. My event was the Hat Dash and so far I’ve made 1 hat and cast on the second my goal for this style hat is 10 by Aug. 24th. I hope I’ll make it. It will by far by the fasted knitting I’ve ever done. 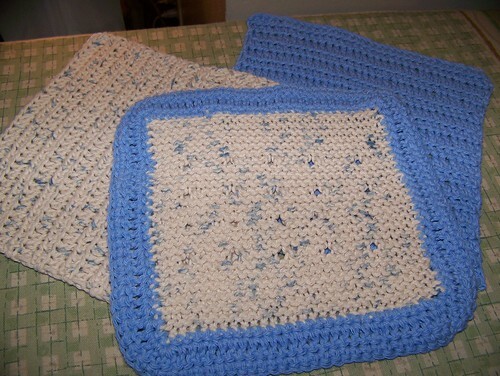 Here’s the 3 washcloths made for the same charity. I have a goal of at least 15 of these. We’ll see how it goes. I think I can make it since the Olympics don’t end until Aug. 24th.